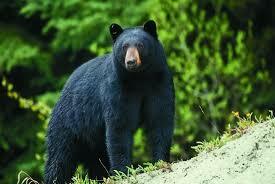 The American Black Bear is the most numerous species of bear in the world. There are hundreds of thousands of them in the United States, and more in Canada. At one time they ranged throughout North America, and into Central America. Their range now spans heavily forested, sparsely populated areas in North America, which includes, Canada, the East Coast Mountains, the Pacific Northwest, the Rocky Mountains, and some of the Southwest, United States. They are endangered only in Mexico. Their range also includes a small portion of Central America. There are bears not far from where I live! The American Black Bear is closely related to the Asian Black Bear. Surprisingly, it is not very closely related to the two much larger species of bears in North America, the Polar Bear, and the Brown Bear. I have seen these bears up close, and had a friend that went way too close, when the bear was hunting! Please remember these animals may look cuddly, but they are wild and can be quite dangerous. Never feed a bear! True. Never feed the bear. Yes! Blessings to you Yoshiko! Great information I didn’t know. Thanks! I also loved the video. Thank you Maria! Blessings to you. Yes! I love walking in the woods! Blessings to you Claire. They are so beautiful. It’s too bad we can’t all be friends. Bears are to be respected and left alone, that’s for sure. Scary. Thank you Gigi! I love bears and nature. Blessings to you!